Oxfam’s Oxjam Music Festival has taken place every year since 2006 with the continued objective to raise money to fight poverty and suffering around the world. The idea is for volunteers to arrange gigs under the Oxjam umbrella and each year hundreds do just that with Oxjam music events taking place across the UK. 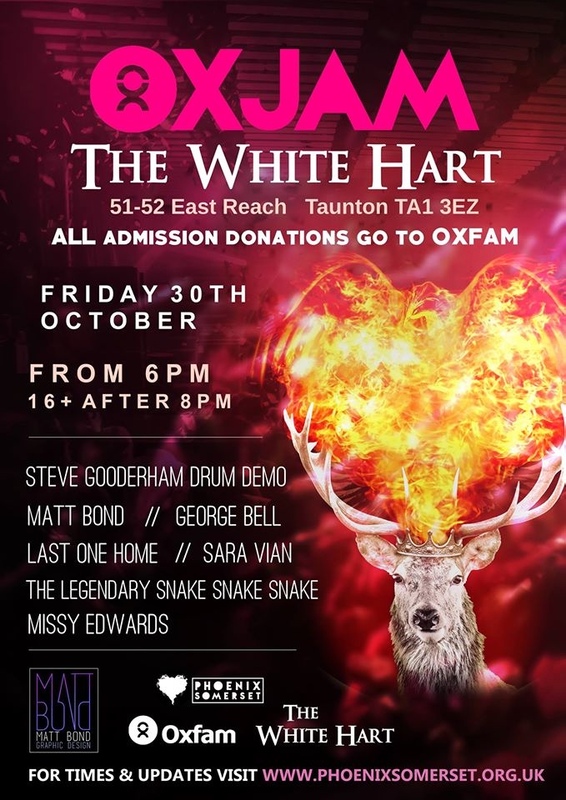 Over the past couple of years we’ve brought you coverage of Oxjam events in the Glastonbury area and this year a posse from Taunton has joined the fundraising effort to host a number of events through October. The team at Community Interest Company Phoenix Somerset has pulled this together since taking on responsibility from musician Mr Keep Calm (Gary Smith) who has firmly established Oxjam events in the area in 2013 and 2014. 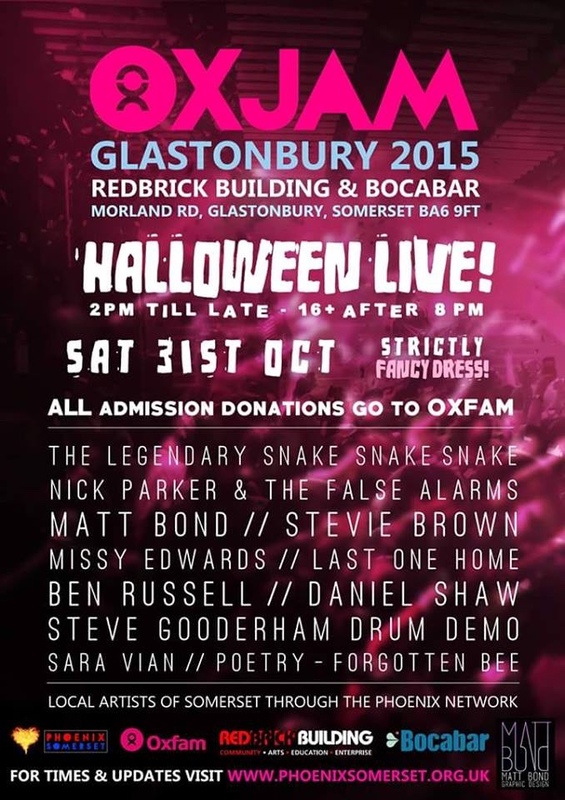 Phoenix’s founder, Lucinda Ackland, and musician Missy Edwards have been the driving force behind these events that started in Glastonbury on Friday 2nd October with a number of events in the likes of Wells, Taunton and Yeovil all raising money for the Oxjam cause taking place in the Autumn days since. 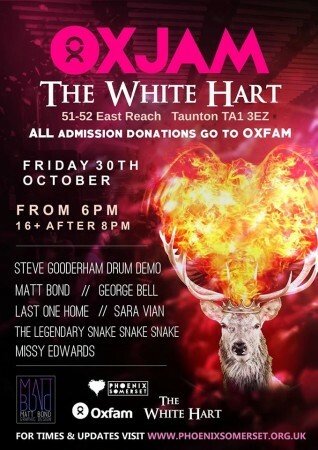 If you’re unable to make the gig on 31st October then there’s also a chance to their other remaining gig with another highly anticipated shindig taking place at The White Hart in Taunton on Friday 30th October (poster on the left) – so there’s still time to donate! 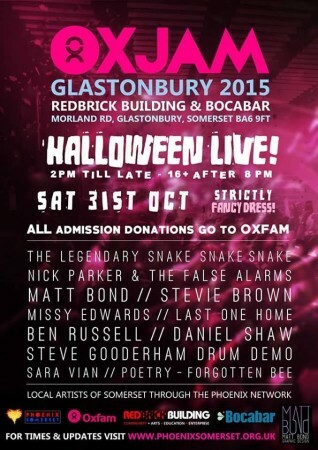 For updates, check out the Oxjam Glastonbury and Taunton Facebook group or visit the Phoenix Somerset website. AND! If you’re new to The Fix then please do stay in touch via our Twitter and Facebook pages – perhaps you should read some of our articles linked below too! Tagged bocabar, glastonbury, marsh fires, missy edwards, nick parker, Oxjam, phoenix somerset, red brick building, taunton. Bookmark the permalink.